The Merchant of Dreams, by Anne Lyle—Night’s Masque #2—is an example of pure storytelling. Rich and well-paced, the second instalment of the series builds on the foundation of The Alchemist of Souls and completely avoids “middle-book syndrome” by becoming a solid middle point for the series, setting a high bar and allowing only for things to get better. Often, what makes a book is a mixture of two elements, perfectly and chemically arranged on a page as suits the author’s style and tastes. Character and plot. If any one ingredient is lacking, or does not gel well enough, then the formula is ruined and the result will be subpar. When reading Lyle you never need to worry about the mixture being right—it always is. Lyle’s skill at writing character sets her apart in the genre and makes her work all the more approachable and identifiable. In The Merchant of Dreams—helpfully hinted at by the gorgeous front cover and the play on Shakespeare’s Merchant of Venice—the cast sets sail on Walsingham’s business to the Serene Republic; Venice. With the richness and wonder of Venice to play with, Lyle set out to really push the imagination and just what she could achieve with her characters and the setting provided. The result is a magical romp through a familiar Venice—with its canals and piazzas and masked parties—with all the tension and intrigue of intelligencers, skraylings and guisers, and secrets nestled between the Serene Republic’s soft bosom—secrets that she wants to keep close to her heart. With Coby’s secret held by Mal, their relationship begins to blossom, awkwardly—though as long as they remain in England there can be no romance between them. On the contrary, Gabriel and Ned have settled into a routine of domestic and romantic normalcy that—mostly—serves to quell Ned’s resurfacing affections for his former lover, Mal, who, despite having freed his twin brother Sandy from Bedlam and having successfully uncovered the mysteries of his past, is as troubled as ever by recent revelations and events. And with Ambassador Kiiren gone from England and Sandy with him, Mal’s humour has been better. When he is ordered to Venice to spy on the skraylings’ sought alliance with Venice, he takes Ned with him, giving Cody strict orders to take care of Sandy, whose return is a welcome surprise, yet one he cannot fully trust. Coby swears to Mal his brother will stay safe. No sooner has the promise been made, than Sandy and Erishen inside him, begin to cause trouble—trouble that forces Coby and Gabriel both from England. Before long, more ungodly trouble hounds Coby, with the appearance of more skraylings, whose betrayal comes at sea and threatens to take them all the way back to the New World. Coby is forced to lie and think quickly and eventually they find themselves following after Mal and heading to Venice. Meanwhile Ned is hardly cut out for the life Mal has introduced him to, and though he is a dab hand on a ship, he soon tires of being away from Gabriel and being surrounded by men on a ship who take a dislike to his preferences. More danger abounds before they even reach the Serene Republic, and with Sir Walter Raleigh in tow and appearances on the up-and-up, Mal is struggling to get done what needs doing, without arousing suspicion regarding his own secret past. After attacks at sea, storms and pirates, being in Venice should be an easy game, but Mal discovers otherwise when he finds there is no access to the skraylings or Kiiren, and that Venice is ruled from the shadows by at least one guiser. Under the cover of seeking his brother Charles, who is rumoured to be in Venice, Mal treads as lightly as he dares through the streets of Venice, which he finds are not as serene as the name implies. The Merchant of Dreams is a complete success that invites you into a world of intrigue and danger, fencing and romance. The sexual tension between Ned and Mal is beautifully written and adds not only a depth to the relationship, but a streak of realism. Lyle successfully writes gay and bisexual characters as naturally as breathing, and it makes for a deeply enjoyable read. Gabriel and Ned are as enjoyable as Coby and Mal, Sandy and Kiiren. In fact, the relationships between Lyle’s male characters take the book to another level for me. She writes homosexual characters and shoehorns nothing for any minority (perceived or otherwise)—she just happens to write Gabriel and Ned, who love each other and do the dirty, and Ned, who is Mal’s former lover, who happens to enjoy the womenfolk as well. It’s as simple as that and I appreciate seeing more than just a homosexual character there for decoration, or to be penned in on all sides by heteronormative characters. Never mind the mythological bisexual character, appearing, nowhere, ever! It’s refreshing, and damn if I don’t enjoy reading about pretty Gabriel and brooding Mal. Coby, too, is a brilliant example of a cross-dressing heroine doing it more—by now—because she enjoys being Jacob Hendricks as well as Mina Hendricks. It raises fantastic questions about gender in a new way—and I love it. In fact, I loved everything about The Merchant of Dreams: it is exciting, thrilling and Lyle’s gorgeous prose drives the story elegantly forwards towards a goal. Lyle is good at endings—not all writers are—and amidst the bittersweet closing chapters lie the seeds of a plot that could have some incredibly awesome consequences, should they be allowed to bloom. 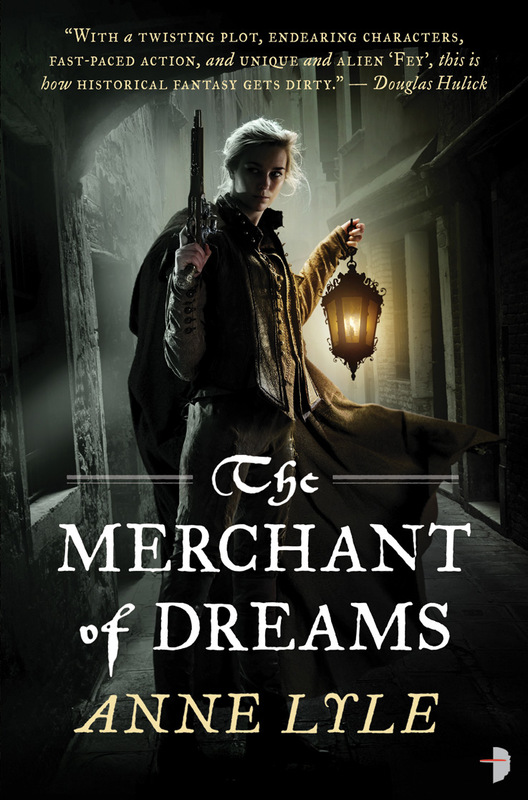 A fantastic example of historical fantasy going all the way and holding nothing back, The Merchant of Dreams is complex and exciting. Gorgeous prose, stunning ability to weave a story, and likeable, moreish characters—Lyle is a winner. Read her. A strange, enchanted boy-thing with bookish tendencies, black eyeliner and a penchant for dark attire. Probably a changeling, definitely a dreamer and certainly a witch. Disabled anxiety juggler, cat herder, aspiring author. Pan-ace with panache, faerie prince pledged eternally to winter. Approximately 90% stardust; 10% words. Provide your email address and get post updates - please support Jet Black Ink!